Got a lot of painted plastic on that nice GT of your's, right? Break it up and set yourself apart with this simple and clean ten (10) piece graphics kit (includes two  BMW Motorrad decals provided at no charge - yeah, that's right, for FREE). 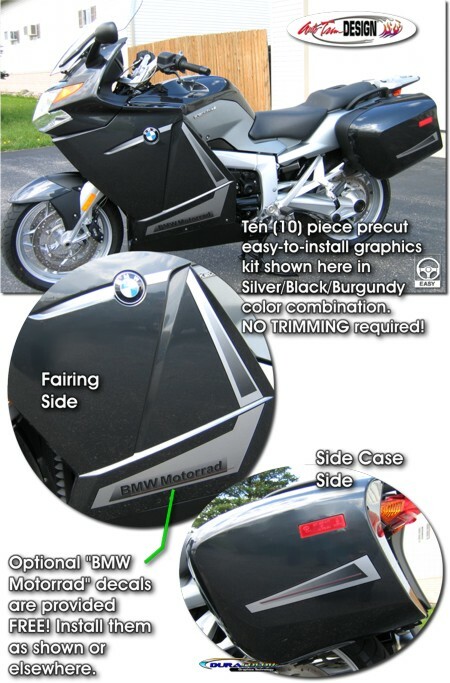 Created specifically for '06-Current BMW K 1200/1300 GT bikes, this kit will dress up your bike in no time. Available in six (6) different color schemes, this unique kit is precut and very easy to install in the areas shown. Moreover, the graphics are covered with a 2.5 mil clear laminate which will protect the graphics from miles of abuse. Note: Upper fairing vent pieces shown on the K 1200 GT are not used for K 1300 GT fitment.